Enjoy the most up to date version of Wear OS by Google with state of the art proactive help from the Google Assistant and smarter health coaching from Google Fit. You’ll also enjoy Master Tools such as a stopwatch, a compass, a timer, an altimeter, calibration, a barometer, and a wrist gesture feature for hands-free navigation. Never lose track of time again, with the only full-screen Wear OS smartwatch with mechanical hands. 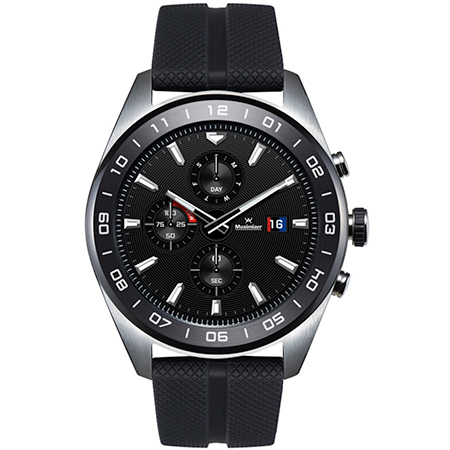 LG’s Watch W7 offers a high end stainless-steel design with a 1.2 inch display that offers efficient usability and touch control. With an IP68-rating, the LG Watch W7 can be used in up to one meter of water for up to 30 minutes and it’s sealed against damage from dust and dirt.